At the Wild Wool Workshop Susan Denham-Smith offers a exciting, informative and versatile programme of craft-based workshops suitable for KS1 and 2, using wool and yarns from fibres found in the Ennerdale Valley. The workshops are hands-on using traditional equipment and practices. The courses can take place in the school or in the Workshop (small groups or classes up to 15 in the workshop, 30 in the classroom). 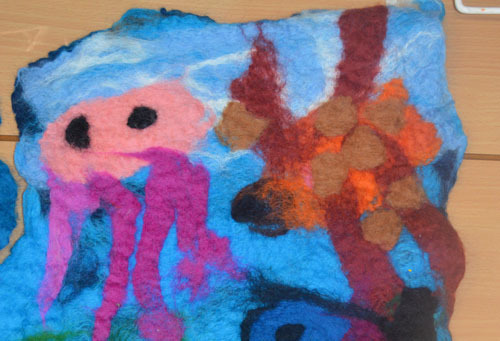 The children will have great fun using the textiles and fibres found in the Ennerdale Valley, to create their own craft works based on their own design. Using, spinning, weaving, felting and other stitching techniques. In the Wild Wool Workshop studio the children will gain hands-on experience of heritage crafts. They will learn how traditional, hand-powered equipment works including spinning wheels and looms, and they will explore their own design ideas and produce their own creative works of art. At the Wild Wool Workshop the children will be engaged, encouraged, inspired and challenged to experiment and invent using; the wool they will see on the sheep in the fields close to home, plants they find in the garden or by recycling materials they find in their every day lives. They will see a craftperson at work, using the hand-tools, which have been instrumental in shaping our textile heritage.